2015 Independent Label Services, Inc. SEVEN WITCHES is a New Jersey-based heavy metal band formed by guitarist Jack Frost in 1998. Over the years, Frost has played with a variety of bands including BELLADONNA, BRONX CASKET COMPANY, SAVATAGE and METALIUM, but every few years he returns to make another SEVEN WITCHES album. The band has a revolving door lineup, with members coming and going depending on their availability. In the past, the band has featured vocalists such as Alan Tecchio (HADES), Wade Black (CRIMSON GLORY) and James Rivera (HELSTAR), as well as bass players such as Joey Vera (ARMORED SAINT) and Mike LePond (SYMPHONY X). The current line-up on The Way Of The Wicked is: Jack Frost - guitar, Anthony Cross (ATTACKER) - vocals, Ronnie Parkes (BONFIRE) - bass and Johnny Kelly (TYPE-O NEGATIVE/DANZIG) - drums. I own all the band’s releases and have been following them most of their career. 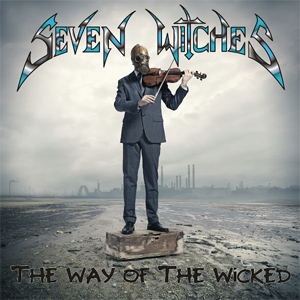 This new album follows very closely to the back-to-basics stripped-down style SEVEN WITCHES adopted on Rebirth (2013). I went back and listened to Rebirth again and this album is very similar in sound and tone. I also listened to the album before that, 2011’s Call Upon The Wicked (which featured Rivera on vocals) and to be honest, the band sounds nothing like that anymore. The production is kind of raw on The Way of The Wicked, but actually not that bad, with emphasis on the rhythm section. Cross’ voice reminds me of a rawer Jeff Keith (TESLA), so you do not get the high-pitched vocal style of Rivera, but his voice is still unique. The down ‘n’ dirty approach has some appeal on tracks like “Among Us”, “Soul Searching”, “Without Man” and “When I Flew”. I feel like these tracks work best and probably express what SEVEN WITCHES are about in 2015. The main riff in “Without Man” is killer and the pace of the song is faster than most on the album. To be honest, there are some tracks that I feel don’t work at all, like “Dreams” or the title track, both of which fell flat for me. The album is fairly short by today’s standards (9 songs, 41 minutes) so perhaps another killer cover of a metal classic was needed here. I would like to see SEVEN WITCHES return with a little more fire in the next album, with maybe some faster paced songs. I guess I am more of a fan of the uptempo material by SEVEN WITCHES, in particular the albums featuring James Rivera and even Alan Tecchio, both of whom I thought did great work with the band. All in all, The Way Of The Wicked is not a bad album, just not as good as classics like Year Of The Witch (2003) or Call Upon The Wicked (2011). This is definitely worth your investment if you are a SEVEN WITCHES fan. Pre-Order your copy of The Way Of The Wicked in the KNAC.COM More Store right HERE.